TOUR GUIDE RESPONSE: Thank you Pam. It was a pleasure to tour with you all. Ruben gave us a once in a lifetime 6 day tour of Vicenza and the Palladian villas. My wife and I had many specific requests which he made possible and then offered us one or more additional adventures each day. His choices were incredibly intuitive. We saw 14 Palladio villas and his in town sites within Vicenza as well as 5 nonPalladio villas. Ruben is both very knowledgeable and personable. In 50 years of travel I have never had a better guide. TOUR GUIDE RESPONSE: Thank you, it was my very pleasure to show you Vicenza and the Palladian villas. It was great to have met you and Carol. Hope to see you again soon. This is a very specializes tour, as it focuses on a fairly narrow segment of the region's history. If you are interested in the Palladian villas, and the Venetian villas, you will really enjoy this. Ruben took us to see three villas, each very different from the other. He does a very nice job of putting each in its historical context. TOUR GUIDE RESPONSE: Dear Larry, Thank you very much. I'm glad you enjoyed the tour. Ruben does a very nice job of presenting Padova to the visitor. 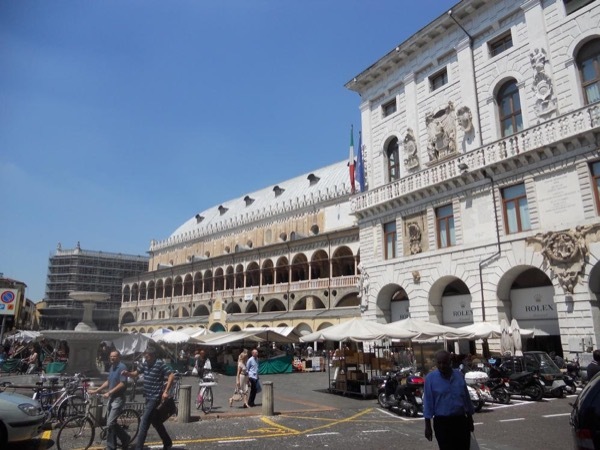 He gives a well rounded tour, covering Padova's ancient history to the present. He is knowledgeable and very personable. TOUR GUIDE RESPONSE: Dear Larry, Thank you very much for your message. I'm glad you enjoyed the tour. I hope to see you again in Padua. TOUR GUIDE RESPONSE: Thank you very much. It was a pleasure to meet you and spend time together in Vicenza. Ruben was a very good guide. In particular, his introduction about the Scrovegni Chapel and his guidance when we were in there (especially in view of the very limited time that is available) was excellent and this was the main purpose for our tour. He was also very helpful and flexible - suggesting where we could meet and providing good recommendations about where we could eat. He is very knowledgeable with a relaxed manner. TOUR GUIDE RESPONSE: Thank you Alison. I am glad you enjoyed the tour. This was an excellent tour of 4 Brenta Canal villas, with wonderful narration about their history and families. Touring with Reuben gave us the chance to really enjoy the day, learn a great deal and not worry about the logistics of driving and locating these sites. We highly recommend this tour, one which has been on our bucket list for a long time! TOUR GUIDE RESPONSE: Thank you very much Susan. It was also my pleasure to meet you. It was a pleasure to meet Reuben and we thoroughly enjoyed the tour. He was very knowledgeable and informative and we certainly learned a lot about a city he knows very well. All his arrangements were perfect - from meeting us in a timely manner to obtaining advance tickets for the Scrovegni Chapel. We covered a lot of ground and feel that we had a good first introductory tour of this interesting city. TOUR GUIDE RESPONSE: Thank you Susan. Enjoy your pictures. Ruben was an excellent guide who answered all our questions with ease. He is especially knowledgeable about architecture and frescoes. We learned a lot and had a great day. TOUR GUIDE RESPONSE: Thank you so much Ross. I'm glad you had a great day. Enjoy your trip to Tuscany. We were very satisfied with Rueben, he was great and very helpful , as my wife and I are handicapped. TOUR GUIDE RESPONSE: Thank you Gerald. I'm glad you enjoyed the tour. TOUR GUIDE RESPONSE: Tony asked me and I told him about religion, culture, roman history, the Renaissance, about universe and Copernicus, about local economy in Vicenza in the XVI century. All this and more besides all the palladian buildings. 3 hours are a short time.Tony probably didn't read that villa La Rotonda is not included in my walking tour of the city. Anyway, I asked him, at the beginning of the tour if he was interested to. So I took him to the villa even if not included. I'm glad he enjoyed his meal. Ruben was very informational and a pleasure to travel with around Padua. I found the entire day very enjoyable and wish I had had more time to spend in Padua. TOUR GUIDE RESPONSE: Thank you Lynn. I am glad you enjoyed the tour. See you next time in Padua. TOUR GUIDE RESPONSE: Thank you Jane. Glad you enjoyed the tour! Ruben was an excellent guide through the city of Vicenza, taking into consideration the interests of each of our party. He adapted his tour to interest the engineers, historian, artist and Italophiles among us. Perhaps he has conducted this tour many times, but he was as enthusiastic to share his knowledge with us as he might have been the first time. Having Ruben guide us was like having a good, knowledgable friend show us around, as though he really cared that we enjoyed ourselves and learned a lot. TOUR GUIDE RESPONSE: Thank you very much! Hope to see you again in Vicenza! Ruben is a very good guide. He has considerable knowledge of architecture, art and history. His knowledge extends beyond Vicenza and was thereby able to put into context the work of Palladio with what was happening elsewhere in Italy at the time. His language skills are superior and he answered all our questions completely and clearly. We highly recommend Ruben and will contact him the future. TOUR GUIDE RESPONSE: Thank you. Let me know when you are again in the area. Ruben arrived promptly at our accommodation and gave us a most informative and interesting tour of the Scrovegni and Padova. Very knowledgeable about the art and history. I would recommend him as a guide. Ruben crated a special tour for us since we wanted to see both Vicenza and Padua in one day -- a somewhat tall order. This included sights in both cities and a trip outside Vicenza to see one of the Palladian villas, the Villa Rotunda. He was knowledgeable, pleasant, and agreeable to modifying things as we went. This tour guide is absolutely fantastic. He is friendly and helpful. He has an encyclopaedic knowledge of the works of Palladio and the decorations and frescoes in the Palladian villas. He took his time to show and explain everything at a pace which suited us and took us to two additional villas which were not included in the original tour. His knowledge of the subject matter of the Giambattista Tiepolo frescoes in the Villa Valmorana at Vicenza was breathtaking. Ruben was excellent guide - friendly, knowledgeable, good English. We took train Venice to Padua (v easy), met R at station. Walked to Scrovegni Chapel (R had bought tickets), thru old city to St Anthony Church, back to car park near station. 5 km walking - wear comfort shoes. After lunch drove to 3 villas between Padua and Venice. Villa Foscari La Malcontenta excellent. Villa Pisano not great. Let R select villas - ask to visit historic ones BUILT by Palladio even if it means more driving. Ruben was a fantastic guide with an extraordinary depth of knowledge. TOUR GUIDE RESPONSE: Thank you Tamara! The tour was excellent - took us to all of the sites. One can do them on your own, but Ruben brought a good perspective and made getting around the town very easy. He is very knowledgeable - at the Olympic Theatre he was able to have the guard give us a demonstration. The tour is well worth it. He gave a lot of helpful recommendations that helped us with the rest of the time in Vicenza. Ruben was great. Always prompt in responding to our emails and questions. Showed up at the hotel to pick us up sharp on time. Drove us safely and dropped us back off safely. Explained everything in detail to us. We would not hesitate to recommend Ruben to our friends or for any travel groups. We certainly will use Ruben again if we plan to visit Italy again. In short it was a very memorable and pleasurable tour. Very knowledgable, helpful and informative tour. Ruben was really easy to talk with and provided us with a thorough and interesting tour of Vicenza. TOUR GUIDE RESPONSE: Thank you Hayley and Steve. See you in New Zealand. We were looking forward to a private architectural tour of Palladio's work on our recent family vacation as part of a father's day gift to my husband, an architect, who wanted more than the typical touristy fare. Ruben was great and customized the tour extend it an extra hour, pick us up at our hotel instead of the train station, and made stops along the way based on our interest. We had the Villa Rotonda pretty much to ourselves before heading into town for other architectural gems. We really enjoyed our tour of Padua and the Scrovegni chapel with Ruben a few weeks ago. Ruben was very responsive before the tour when I had questions about our meeting point, etc. and he met us as planned at the track where our train from Venice arrived. He is very knowledgeable and pleasant, and we learned a great deal about Padua - including the University, the Jewish Quarter, and of course the Scrovegni chapel. We would highly recommend him!! Ruben was on time, well organised, and informative. He greatly increased our enjoyment of our visit to Padua. TOUR GUIDE RESPONSE: Grazie mille. We combined two tours into one long day. It was perfect for our schedule. Thanks to Reuben we saw everything we wanted to in an efficient yet unhurried way. He was informative and flexible. His English was perfect, and we also got to practice Spanish and learned a little Italian. Responsive, reliable and knowledgable, he shaped our tour to provide just what we wanted. He was friendly and efficient, an ideal guide. TOUR GUIDE RESPONSE: Thank you. I'm glad you enjoyed the tour. The highlight of our trip to Italy and the Adriatic! And it was due to Rubin's willingness to share his deep knowledge of Padua with us. He met us at the train station and walked with us to all the sights on our list, continuously sharing what he knew (which was amazing!) about lovely Padua -- archetectural, cultural, social, and much more. His brilliant tour of the Scrovegni Chapel in a very limited time (forced by the officials of the Chapel) was masterful. Another perfect ToursByLocals experience! TOUR GUIDE RESPONSE: Thank you very much. I'm glad you enjoyed the tour! Ruben has been an impeccable guide (not for nothing he is Spanish and it shows). All explanations, knowledge in Arqutectonico aspect that are of general interest have been extremely interesting. Walkable city is the best experience, at least for me and my group. His advice added to the beauty of the city of Vicenza and its people gave an impression of singilar wealth. I totally recommend this excursion, the charming town and of course Ruben. A big hug and congratulations for me to have you as my guide. TOUR GUIDE RESPONSE: ¡Muchas gracias Gustavo! ¡Hasta la próxima! Although the students I was chaperoning were very tired after traveling all night by bus from Freiburg in Germany to Padua, Ruben's tour was so lively and interesting that nobody had Problems following or fell asleep! The 3 hour tour seemed like 1 hour, which is always a good sign. The pace was perfect, nice and Relaxing and we had time to take in our surroundings. A very personable guide. Ruben is a wonderful guide. He is kind and caring about your experience. He is extremely knowledgeable and lets you guide how much information you wish about sites and history instead of bombarding you with information. He is flexible and offers many suggestions within a tour/city of what approach you may take. I have completed two tours with Ruben now and hope to do so again. TOUR GUIDE RESPONSE: Thank you Cynthia. I'm glad you had fun. I hope to see you again. I recommend the tour of Padua, that is very an amazing place. Ruben for sure demonstrated to be a valued guide and be able to provide all explanations required and to manage the tour in the time and contents previously agreed. I recommend such tour and Ruben as professional and valuable guide. TOUR GUIDE RESPONSE: Thank you Matteo. I'm glad you had a nice experience. Ruben was guiding us in a nice and informative way through Padova, covering the "hotspots" and explaining with the right level of detail a wide range of topics (from university/education, church and religion, history and art) - again thanks for that; we enjoyed it a lot. TOUR GUIDE RESPONSE: Thank you very much! I am glad you had a great time! Ruben was a fantastic guide for the day! It was a wonderful exploration of the local villas and gardens capped off with a tremendous lunch in a local family run trattoria. I enjoyed Ruben's explanation of the construction and art within the villas and his patience with my many questions about not just the villas but the culture, then and now. I had a wonderful day and hope to have a chance to enjoy another tour in the area another trip. Thank you Ruben! TOUR GUIDE RESPONSE: Thank you very much Cynthia for your comment. I'am glad you had a great time. Hope to see you again. Ruben has very nice personality, he is very knowledgeable about history and art of Vicenza. We also had very nice lunch in excellent restaurant in Vicenza vicinity. Bottom line, we would recommend Ruben without hesitation to anybody interested in Palladio legacy. TOUR GUIDE RESPONSE: Thank you Vladimir for your comment. I am glad to know you enjoyed the tour in Vicenza. A good tour and and we learnt a lot however we felt that the lunch stop was not really necessary. We accept that we chose the timing but we had not anticipated the break and feel that it could have been discussed with us in advance. Having said that Ruben is a good guide! Well organized, very informative tour of these towns. Ruben is passionate about his cities. A great travel experience. TOUR GUIDE RESPONSE: Thank you very much! Hope to see you again!! It has always been very important to me to visit my grandparents home town in Italy. Since I don't speak Italian, I scheduled a private tour to take me to their town. Ruben was an excellent guide. He was very personable and made me feel very comfortable. Ruben went out of his way to make sure my tour was a success. With Ruben's help I was able to find my great grandfather's home, visited the towns, and got copies of marriage and birth records of my relatives. I highly recommend Ruben for your tour. Ruben gave us a great tour of Padua today. He was VERY interesting, friendly, knowledgeable and helpful. He went our of his way to show us everything we wanted to see. He showed up promptly and at the end of the tour made sure we caught the correct train back to Venice. We would HIGHLY recommend Ruben! Thank you Ruben for a wonderful experience...we couldn't have asked for a better tour or guide! TOUR GUIDE RESPONSE: Thank you very much for your comments, I'm glad you enjoyed your visit. I hope to see you soon! Ruben was punctual, knowledgable and very interesting. He also told us where to eat dinner and it was great. A few times we had a hard time understanding him, but then I don't think you can expect anyone to be accent free in English when their mother tongue us Spanish and he lives in Italy giving tours in English! We loved that Ruben's wife is from Hurst, around the corner from Dallas, our home! He's even visiting at Christmas and we thought how cool if we could see him again! It's a small world really.